Kaybridge was awarded the groundworks and reinforced concrete frame package on this Bellway Homes project regenerating a former factory site to provide 264 modern new homes including apartments and mews houses of mixed tenure. The 1.5 hectare development spread over both sides of Lawrence Road necessitated the supply, install and co-ordination of four tower cranes working in synchronisation servicing the six blocks. Over nine hundred piles were installed to create the four reinforced concrete frames up to seven storeys. Providing 1, 2 and 3 bedroom apartments in a confined location close to the Hammersmith Broadway, the project involved the construction of a basement car park consisting of 366 contiguous piles up to 19m deep boarded on both sides by existing residential properties. Caisson shaft units were formed to provide foul and storm water pumping chambers. 2 No reinforced 4 storey concrete frames were constructed on top of the basement car park squeezed between existing residential houses. 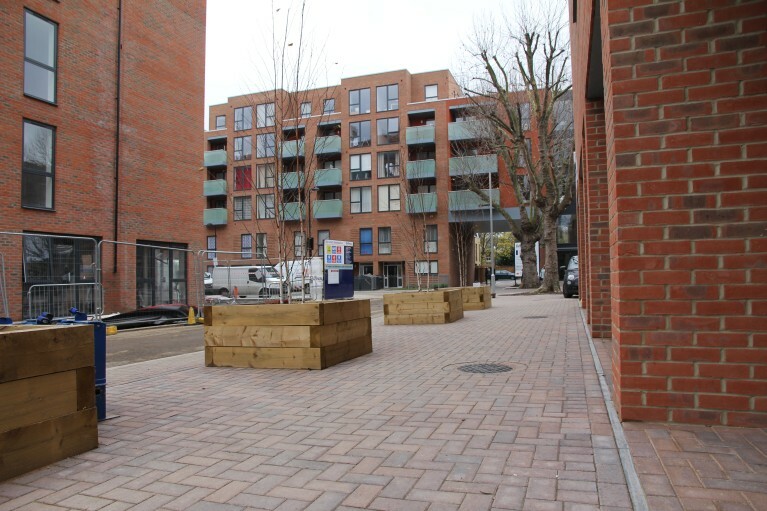 Due to the location within narrow residential areas with high footfall and opposite a school, careful logistic planning was required to ensure the safety of the public and continuity of the project.